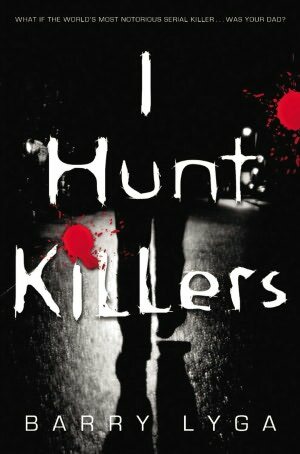 For those of you who haven’t yet read I HUNT KILLERS by Barry Lyga, he’s written an intense novel in which Jazz, the teenaged son of the world’s worst serial killer, becomes obsessed with hunting a new murderer in order to prove that the “training” he received from his father during his formative years can be used for good. (This to counteract the fear that he and others have that Jazz may follow in his father’s footsteps.) It’s a wonderful novel, both psychologically and suspensefully, and so realistic in the way that Jazz must constantly fight his father’s brainwashing and the fears raised about his future. It’s not often that I write fan letters – I should probably do this a lot more frequently, but as an agent I always worry that people will suspect ulterior motives—but I met Barry years ago, and had to reach out to tell him how much I enjoyed I HUNT KILLERS and to pick his brain about how he was able to maintain his own sanity while getting into the right mindset to make the novel truly authentic. Here are my questions and his answers. Barry, I’m blown away with the way that you were able to put yourself into your protagonist’s head and to create someone at once so appealing and potentially scary. What kind of research did you have to do in order to create Jazz and his father, Billy Dent? Thanks! Before I wrote the book, I sort of immersed myself in all things serial killer. I spent a few months reading nothing but books about law enforcement and forensic science and serial killer profiles and the history of serial murder. There was a temptation early on to take all of that reading and use it very specifically and sort of make everything in my book a reference to that real-world information in some way, but then I just decided that it would be best to let my research linger in my head and inform the mood of the book, rather than the details. So Billy, for example, isn’t based on any real person. He’s a figment of my imagination, filtered through all of that reading. And Jazz is really just… There aren’t many books about the children of serial killers, at least none that I found or read. So I just did what I always do, for every book: I thought to myself, “Imagine you’re a kid in this particular situation. What happens now?” And I ran with it. Did you ever find the mood of the story affecting you personally? If so, were there strategies you used for getting into the mindset and back out again? Nah. I know the safe answer is something like, “Oh, yeah, it was horrifying to write this… I was so disturbed…” But it didn’t bother me at all. My friends joke that I was born without a soul because I have no problem jumping right in and writing some of the gruesome and psychologically messed up stuff in the book. I don’t have to get into any specific mindset. I just sit down and boom! I’m there. And when I’m done, I’m done. Doesn’t bother me or affect me. Was there any personal experience or background you were able to draw on to evoke the emotions within the novel? I think everything written, no matter what it is, has some kind of background in the author’s self and history. It’s not like my dad’s a serial killer or anything, but I’ve had — we’ve all had — that moment in our lives when we think, “Am I going to grow up to be just like my parents?” And that can either thrill you or terrify you. It’s a universal thing and it’s easy to tap into. And I think Jazz’s fear of himself, of his own power, is universal, too, as we grow up and come out of the haze of adolescent hormones and begin to realize that there are people who matter in the world and that we have the ability to hurt them or to help them. So, yeah, I drew on that stuff and sort of ramped it up because for Jazz these issues are literally a matter of life and death. As much as I love Jazz, his best friend Howie is probably my favorite character in the novel. Do you want to discuss how he came to be? Aw, I am so glad to hear that! I love Howie. I was so terrified that he was going to succumb to Best Friend Syndrome. I resisted letting him be funny at first because the best friend is ALWAYS funny and I’m sort of tired of that. But then he developed this dark gallows humor about him, and he’s got this knowledge that he could die so easily, and it made him feel very real and very new to me. At first, I just thought it would be sort of funny and interesting to have Jazz’s friend be a hemophiliac. It was the idea of juxtaposing the ultimate killer with the ultimate victim. Because you know Jazz could kill Howie in a fraction of a second. And then that knowledge sort of filtered down for me and I realized that by being friends with Howie, Jazz has put himself in a position where he’s constantly reminded of the frailty of human life. And Howie allows himself to be in that position, to be that reminder. It just all came together really nicely and I’m so happy with the two of them. There’s a lot more of Howie in the second book, so I’m glad people seem to like him! Can you talk a little about the process? How many drafts did you have to go through? Did you have to dig yourself deeper with each one? The momentum on the plotting and pacing are so strong that I wonder…. I typically don’t go through many drafts. I usually do one on my own and then do a clean up and then another with my editor and we’re done. But I’d never written a mystery before and when I finished the first draft of KILLERS, every damn person who read it figured out who the killer was! Every single one of them! So, I did some tweaking and some fixing and… I don’t remember, but I think I did two or three sweeps through it before I gave it to my editor. And then SHE figured out who the killer was! And I was like, “Goddamn it!” But it took her LONGER than it took my beta readers, so I knew I was on the right path! [Laughs] So we did another run-through and then just a quick little tweak after that and it was ready. The bones of the whole thing were there from the beginning, from the first draft: The character arcs, the plot, everything. It was just a little thing, you know — the goddamn mystery! I just had to keep tweaking things and modifying bits to make it work. It was a serious education for me. You can change the direction of the mystery in the reader’s head just by changing a line of dialogue. Like I said — I’d never written anything like this before, so I was sort of learning as I went along. You mentioned momentum and that’s funny because I always feel like my books start really slow and then sort of build from there. And that was all right for my other books, but at some point, I realized, Duh! This book is a thriller! It has to MOVE. And I felt like the beginning was still slow, so I just arbitrarily decided that I would cut ten percent of the first hundred pages of the book. Don’t ask why — I don’t know. I just decided that out of the blue one day. When you break it down, it works out to something like twenty-five words cut from each page. So that’s what I did — I just went through and cut ten percent of the first hundred pages. And honestly, I still think the first forty pages or so are a little slow, but it’s better than it was before. Given the subject matter, was it a challenge at all to convince your agent or the young adult editors that it would be appropriate for the YA market? Not at all! I mean, I lucked out in that regard — my editor was itching to publish a YA novel about serial killers. She had mentioned the idea of such a book and I thought it was sort of too much and disgusting and disturbing, and then one night I woke up in the middle of the night, thinking, “His FATHER is a serial killer!” And I went to my computer at, like, three in the morning and wrote up a proposal. And bang — it all came together. She was a little worried that it was going to be too dark, but when she saw Jazz interacting with Howie and Connie, she saw what I was up to and it’s been smooth sailing all along. Is there anything else you’d like to share? Any other projects you’d like to mention or websites you’d like to direct us to for excerpts or further information? Well, almost diametrically opposite KILLERS, I have a fun middle grade series called ARCHVILLAIN. The last book in that trilogy will be coming out in January. And the second KILLERS book will be out in April. Web-wise, I’m on Facebook at facebook.com/barrylyga, I’m @barrylyga on Twitter, and of course I have my website at barrylyga.com. People can feel free to stalk me at any combination of them! Thanks so much, Barry! It was a pleasure to read I HUNT KILLERS and a pleasure to have you here. I’m already looking forward to the sequel!